Connecticut Power Curber owner Nick Natale of Natale Concrete Construction recently poured a unique profile with his 5700-Super-B for new high school athletic fields. 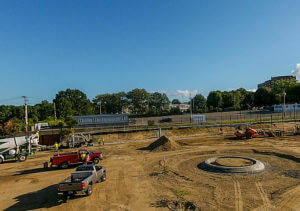 The new Warren Harding High School is being built to replace the existing 90-year old Harding High in Bridgeport, CT. The $106-million school will be over 144,000 square feet and home to 1,150 students. Athletic fields and an eight-lane running track will be built adjacent to the four-story glass and masonry structure. 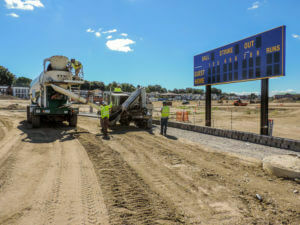 The plans for the Harding baseball and football fields include synthetic turf playing surfaces, which will be anchored into a concrete footing that surrounds the field. Nick Natale’s crew slipformed the turf anchor, a 28-inch (71 cm) wide profile with some complicated angles and radii. The top of the turf anchor is a 10-inch (25 cm) wide level surface, with a 4-inch (10 cm) wide shelf located 2 inches (5 cm) below it. 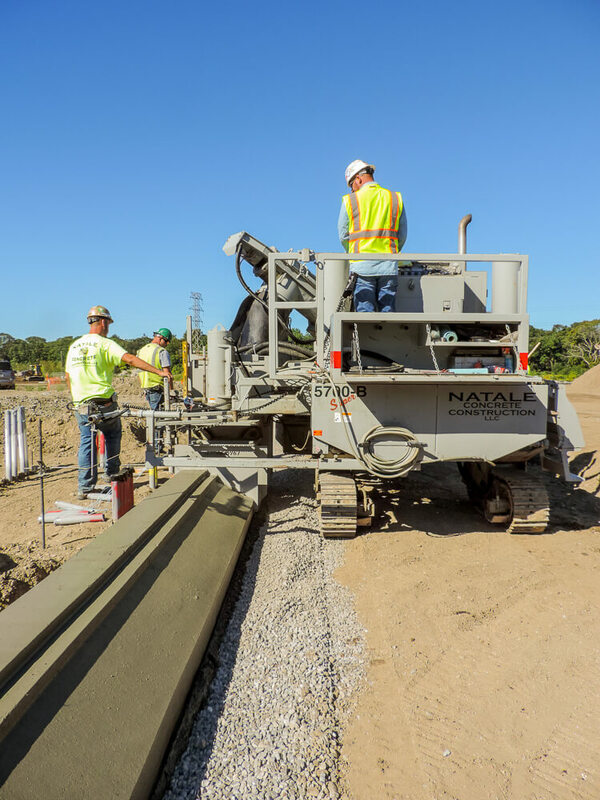 Natale’s crew poured the turf anchor around the perimeter of the fields on a packed subgrade of crushed stone. 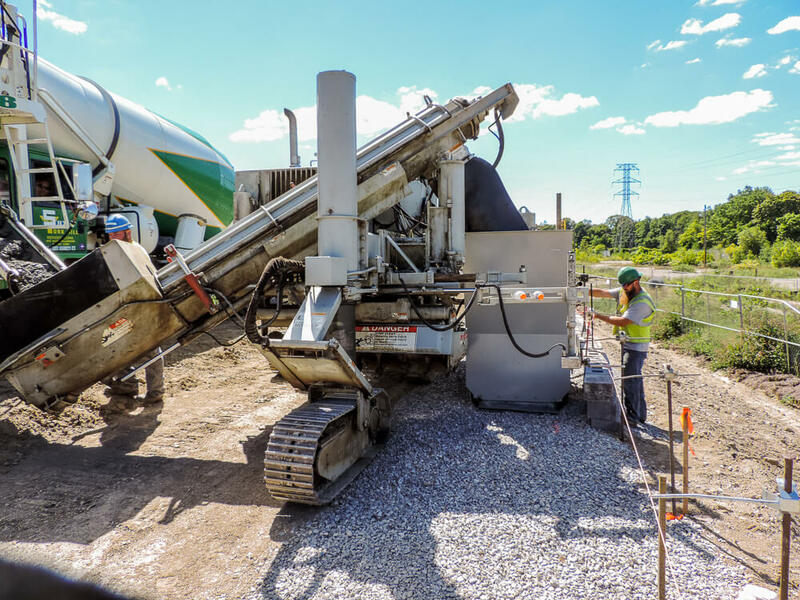 As the preparation of the fields continues, the fields will be filled in with layers of crushed gravel and clay dirt to form the playing surfaces, which will bury the remaining 14 inches (36 cm) of the concrete. 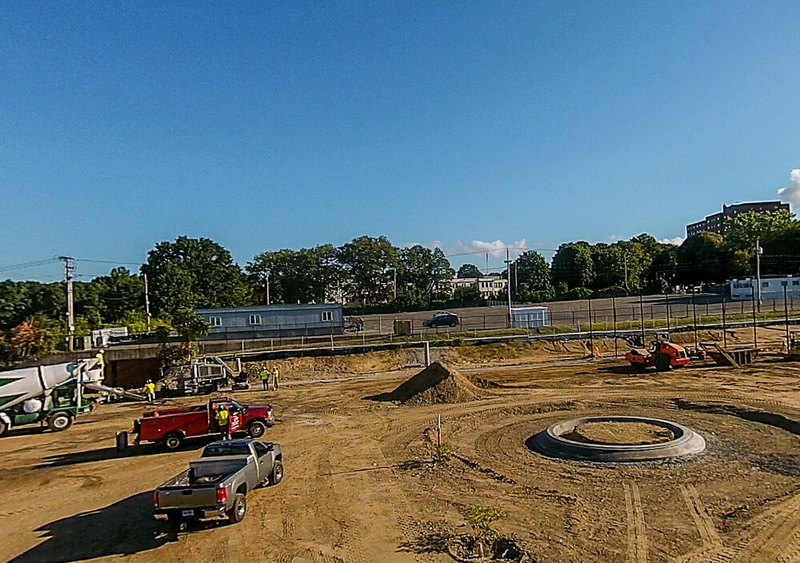 The field turf will then be laid on top of the dirt and anchored onto the 4-inch wide concrete turf shelf. For the baseball field, baseline and outfield fence posts will then be mounted into the 10-inch (25 cm) wide top of the turf anchor. 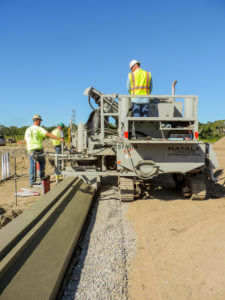 The post holes will be core-drilled into the finished concrete and the posts grouted into place every 6 – 10 feet (1.8 – 3 m). The fence will vary in height from 4 to 10 feet (1.2 – 3 m) high. The turf anchor is also used around the pitcher’s mound to secure the edge of the turf where it meets the dirt of the mount. In this part of the field, since fence posts are not needed, the synthetic turf will be mounted to the top slab of the anchor instead of just to the shelf. Natale installed 1,200 linear feet (366 m) of turf anchor for the baseball field, and an additional 1,400 linear feet (427 m) for the perimeter of the football field. The turf is mounted to the concrete using a combination of glue and stainless steel screws, placed every 18 inches (46 cm). 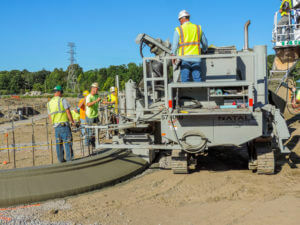 Natale has been in the construction business for over 30 years, starting out doing general labor and hand forming curb and sidewalks. 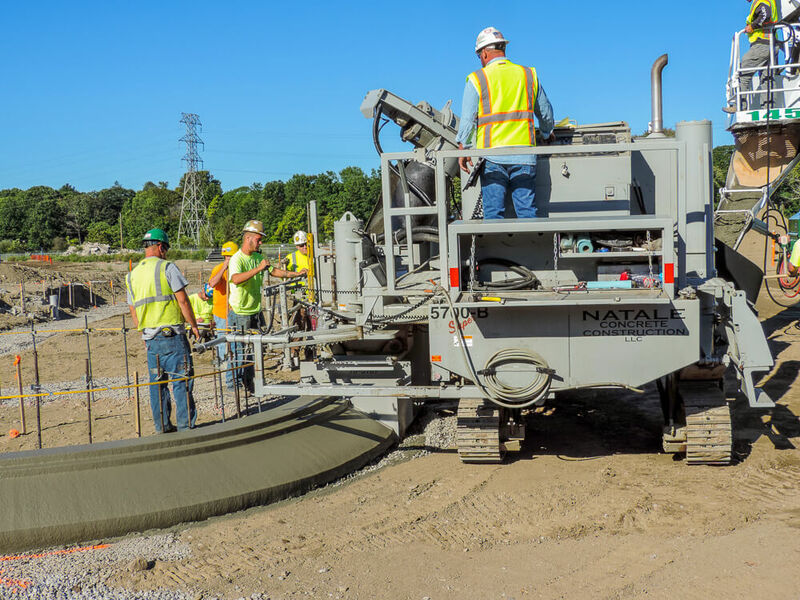 Making the change to a slipform machine was a big change for Natale’s business. 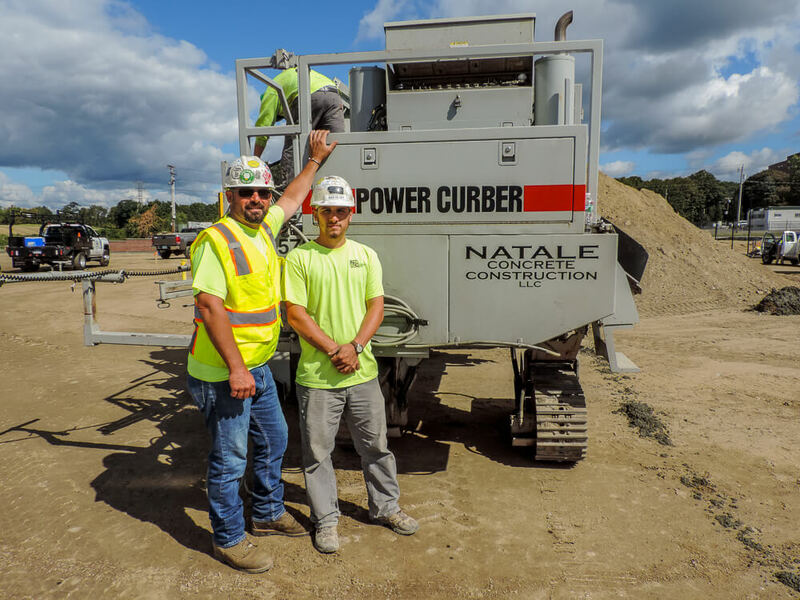 The family-run and operated business now includes Nick’s son Joe, who has worked for his dad for eight years as the foreman. “In New England a lot of people are set in their ways about hand forming, so it can be challenging to convince people that it’s better quality and more productive with the machine, and big savings to say the least,” explains Natale. The site of the new Harding High, at the corner of Boston Avenue and Bond Street, is rich in history. It was home to a Remington Arms rifle factory that dated back to 1915 that was used to manufacture weapons for World War I. In 1920, General Electric (GE) purchased the property and it was used for the manufacture of small motors and other various electrical devices, such as home appliances and rotary switches, until 2007. The GE facilities were torn down by 2012. This past also meant that the site was rich with industrial contaminants, including arsenic, lead, and petroleum-based pollutants, which had to be remediated before the land could be repurposed. 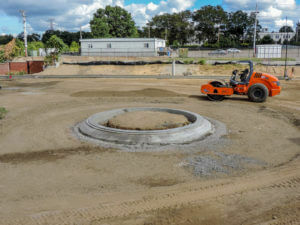 The cleanup had to be approved by the Connecticut Department of Energy and Environmental Protection (DEEP) and included the removal of 10,000 cubic yards of contaminated soil, which was replaced with a four-foot deep blanket of clean fill dirt. 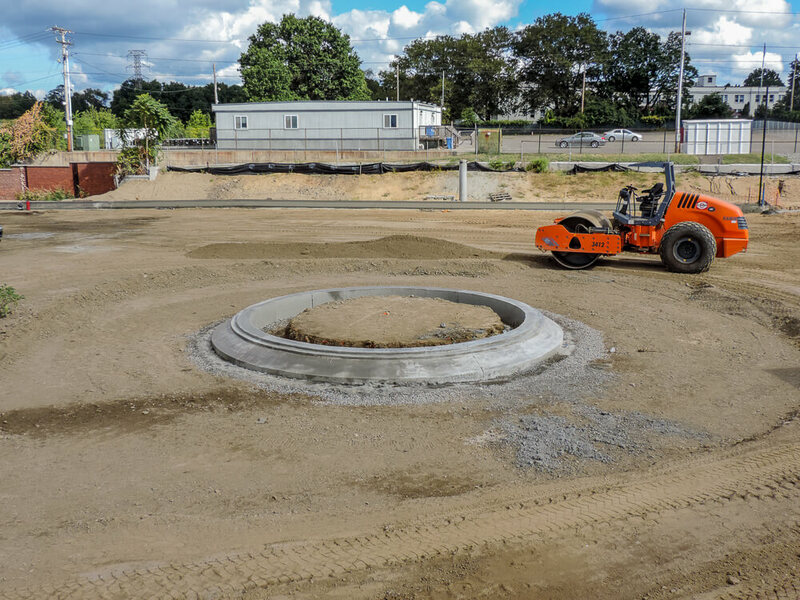 The site of the new school, which covers 17 acres of land, will be given to the City of Bridgeport by GE once the school is completed. GE is also installing an 855-kilowatt solar power system on the site to provide electricity for the school on an additional 3 acres of land. The system will produce 1.2 million kilowatt-hours in its first year, all of which will be used by the school. The new Harding High is expected to open in 2018.